Pick Analysis: Not many players earn first-team all-conference recognition in all four years of their playing career. Elliott, however, did just that for the Tigers, becoming the school's all-time leading scorer as well as setting records for field goals made in total and from 50 yards away or more. This at a school that produced New England Patriots All-Pro Stephen Gostkowski. Elliott made 21-of-26 field goals in 2016, was also an Academic All-American just one year after being named an AP All-American (and Lou Groza Award finalist) for on-the-field play (23-of-28 FG). He started his career with a bang in 2013, going 16-for-18 on field goal attempts including three from 50 yards or more. Elliott had a sophomore slump (21-of-32 FG, 6-of-16 from over 40 yards), but did not miss an extra point throughout his career, making 202 straight. 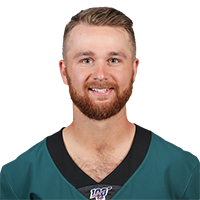 Elliott has been a four-year kickoff specialist, as well, having 210 of his 330 attempts (63.7 percent) count as touchbacks. Published: April 29, 2017 at 02:27 p.m.
Cincinnati Bengals select Memphis kicker Jake Elliott in Round 4 with the No. 153th overall pick in the 2017 NFL Draft. Published: April 19, 2017 at 09:43 a.m. The "Good Morning Football" crew brings the draft story of Memphis kicker Jake Elliott.